MANSFIELD — Cold weather forecasts for late January and into February include as many as 24 daytime or evening temperatures in the teens or lower. This extreme cold air comes right on top of this weekend’s winter storm. 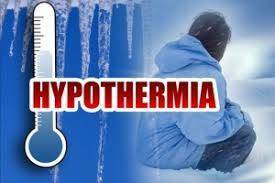 Richland Public Health is reminding residents to be aware of hypothermia (dangerously low body temperature). Hypothermia occurs when more heat escapes from your body than your body can produce. Signs and symptoms of hypothermia may include gradual loss of mental and physical abilities. Severe hypothermia can lead to death. For most people, hypothermia isn’t a serious risk. Still, each year nearly 700 people in the United States die of hypothermia. Common causes are prolonged exposure to cold air or water temperatures. When you’re outdoors — camping, hunting, ice fishing, and skiing — be aware of weather conditions and whether you or others are wet and cold. If you get cold and wet, move indoors and get warm and dry fast — before you develop hypothermia. Often, people aren’t aware that they need help, much less medical attention. Common signs to look for are shivering, which is your body’s attempt to generate heat through muscle activity, and the “-umbles:” Stumbles, Mumbles, Fumbles AND Grumbles. These behaviors may be a result of changes in consciousness and motor coordination caused by hypothermia. Other hypothermia symptoms may include: slurred speech; abnormally slow rate of breathing; cold, pale skin; fatigue, lethargy or apathy. Persons exhibiting these symptoms need medical attention immediately. Children are at greater risk for hypothermia than adults. Children lose heat more rapidly through their skin than adult, and hypothermia in children can occur in temperatures as high as 40 degrees F. This is especially true if clothing is wet or the weather is windy. Senior citizens may be at risk due to normal age-related changes that can make it harder to feel when they are getting cold. Medical conditions and certain prescription medications can affect body heat or reduce blood flow putting seniors at greater risk for hypothermia. Even some over-the-counter medications such as cold remedies can cause problems. Cover. Wear a hat or other protective covering to prevent body heat from escaping from your head, face and neck. Cover your hands with mittens instead of gloves. Mittens are more effective than gloves are because mittens keep your fingers in closer contact with one another. Overexertion. Avoid activities that would cause you to sweat a lot. The combination of wet clothing and cold weather can give you chills. Layers. Wear loose-fitting, layered, lightweight clothing. Outer clothing made of tightly woven, water-repellent material is best for wind protection. Wool, silk or polypropylene inner layers hold more body heat than cotton does. Dry. Stay as dry as possible. In the winter, pay special attention to places where snow can enter, such as in loose mittens or snow boots. Warnings signs of hypothermia in adults include: shivering; exhaustion; confusion, fumbling hands; memory loss, slurred speech; drowsiness. Warnings signs of hypothermia in infants: bright red, cold skin; very low energy. If you notice any of these signs, take the person’s temperature. If it is below 95°, the situation is an emergency, get medical attention immediately. If medical care is not available, begin warming the person, as follows: Get the victim into a warm room or shelter; If the victim has on any wet clothing, remove it; Warm the center of the body first—chest, neck, head, and groin—using an electric blanket, if available. Or use skin-to-skin contact under loose, dry layers of blankets, clothing, towels, or sheets; Warm beverages can help increase the body temperature, but do not give alcoholic beverages. Do not try to give beverages to an unconscious person; After body temperature has increased, keep the person dry and wrapped in a warm blanket, including the head and neck; Get medical attention as soon as possible. A person with severe hypothermia may be unconscious and may not seem to have a pulse or to be breathing. In this case, handle the victim gently, and get emergency assistance immediately. Even if the victim appears dead, CPR should be provided. Frostbite is an injury to the body that is caused by freezing. Frostbite causes a loss of feeling and color in affected areas. It most often affects the nose, ears, cheeks, chin, fingers, or toes. Frostbite can permanently damage the body, and severe cases can lead to amputation. The risk of frostbite is increased in people with reduced blood circulation and among people who are not dressed properly for extremely cold temperatures. What to watch for: At the first signs of redness or pain in any skin area, get out of the cold or protect any exposed skin—frostbite may be beginning. Any of the following signs may indicate frostbite: a white or grayish-yellow skin area; skin that feels unusually firm or waxy; numbness. If you detect symptoms of frostbite, seek medical care. Because frostbite and hypothermia both result from exposure, first determine whether the victim also shows signs of hypothermia, as described previously. Hypothermia is a more serious medical condition and requires emergency medical assistance.